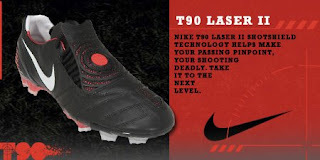 What are 3 New T90 Laser Colors which just arrived? And yes, the Nike Total90 Laser II Firm Ground Soccer Shoes (Black/White/Comet Red) for, you guessed it, $189.99. England & Manchester United's Wayne Rooney and Rio Ferdinand, as well as Spain & Liverpool's Fernando Torres. 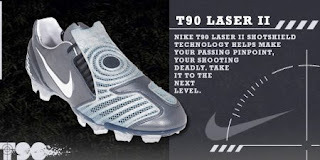 Who are top soccer players who play in the The Nike Total 90 Laser? What is an innovative piece of technology which offers superior boot-to-ball contact by applying the learning from other sports? 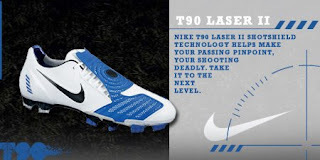 What has been expanded on the Nike Total 90 Laser to allow the athlete to maximize shooting and passing accuracy through better boot-to-ball alignment and targeting? What is an epic fantasy by JRR Tolkien? What are unique precision rings that create optimum trajectory, spin and distance control, with twisted medial rings for more aggressive contact - enhancing ball spin and swerve chances? What is a waterproof fabric that lets sweat escape, maintaining a constant temperature inside the boot while playing? Thanks for playing New Soccer Boot Jeopardy - Goodnight.